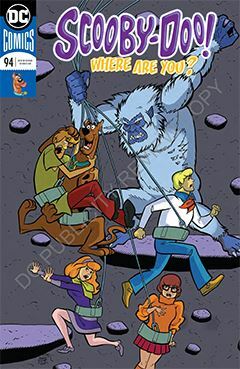 So the Scoobies are called to investigate the appearance of a Yeti at Benjy Kord’s (no relation) Rockin’ Gym, where wall climbing is the order of the day. How could an abominable snowman terrify the gym’s customers without being exposed for the fraud that it is? Well, it can’t as Mystery Inc. soon demonstrates. But wait! Either there is a printing error, or DC Marketing (which provides us with the advance copies of comics) chose not to share the reveal with us in advance. I can appreciate they don’t want spoilers, but this is a new approach I’m not sure I can be on board with. Even so, the story is weak. The three suspects who may or may not behind the yeti scare are only seen off-panel, spoken of but not actually appear. Perhaps the story needed more pages, which wouldn’t be so terrible once in a while. Next comes a four-page story in which an actual ghost invades the Mystery Machine. The gang manages to rid themselves of it (for now), but seeds are planted, suggesting it will return in a future issue. The second feature story involves a witch doctor which is in control of an ancient beast that is terrorizing an African river. Of course, both the witch doctor and the dinosaur are frauds, and his motive and identity are pretty transparent. The story reads as if the audience has entered in the middle. Perhaps it also needed a full issue to flesh out a promising narrative.